Mosquito season is over for now, but even when it’s in full swing, we don’t get a lot of bites as we work in the wetland nursery. I am often asked what we do to control mosquitoes in our wetland nursery at Exploration Green. This little fish, Gambusia affinis, is our first line of defense against mosquitoes in the wetland nursery. 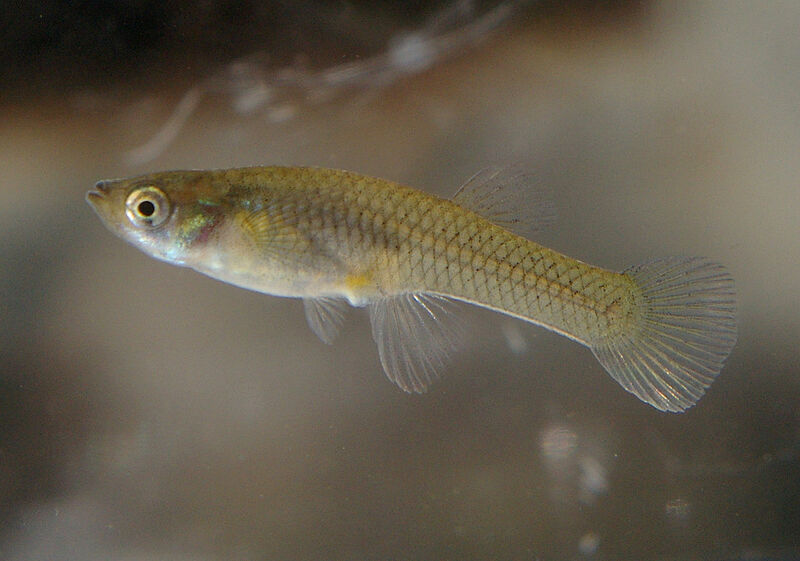 Mosquito fish, or Gambusia minnows, are by far the most efficient natural predators of mosquitoes. 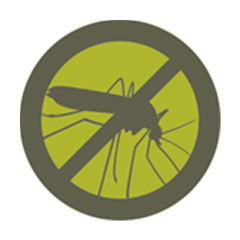 They are utilized by some mosquito control districts across the country. We collected ours in nearby ditches and set them loose in the nursery ponds, where they rapidly breed schools of hungry fish. • According to studies, a single mosquito fish can eat up to 50 mosquito larvae in half an hour. They have been shown to consume 42-167% of their body weight in various invertebrate prey including mosquito larvae per day. • A mature female mosquito fish will typically give birth to 15 to 40 babies (fry) in each brood, and produce 6 to 8 broods during a season. Mosquito fish do not lay eggs. They are live bearers, like guppies. • The mosquito fish Gambusia affinis is native to Texas and can tolerate high water temperatures, low dissolved oxygen levels, and some water pollutants found in urban creeks. 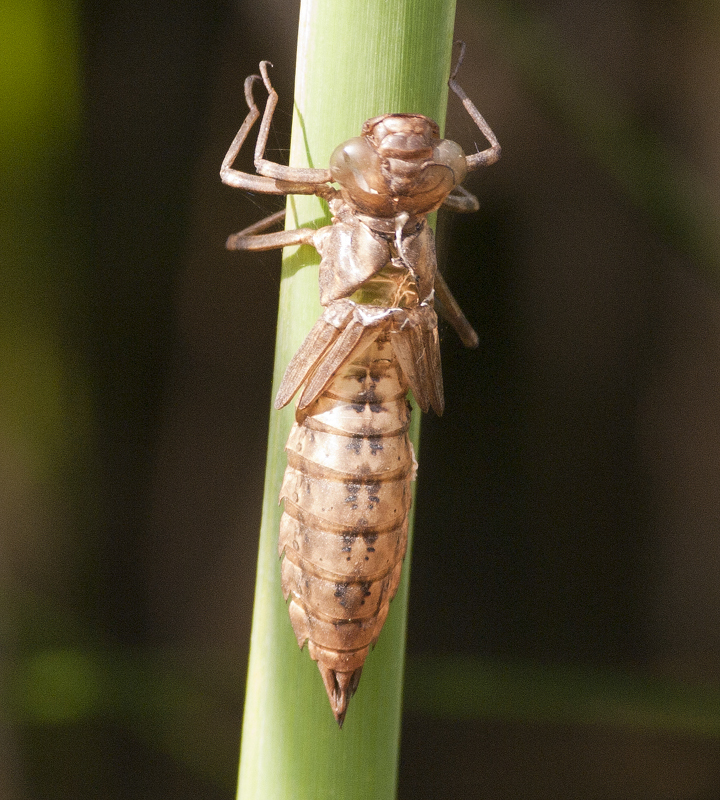 A shell is left where a naiad emerged as an adult dragonfly. Dragonflies and their cousins, the damselflies, are good mosquito predators because in the aquatic larval stage, one of their food sources is mosquito larvae. During this “naiad”stage (which can last up to six years) they will do most of their damage to mosquito populations. Adult dragonflies typically like to feed during the day, when most mosquitoes are hiding. These dragonfly naiads as they are called are voracious and bold little predators and will take on almost any aquatic animal including other naiads. As soon as we added water to our nursery ponds, species of dragonflies and damselflies began dipping down to lay eggs in the water. A couple weeks later, many carapace shells could be seen on the stems of our wetland plants where the first naiads emerged and flew away as adults. Bacillus thuringiensis (Bt) is a naturally occurring bacterium common in soil. Several strains can infect and kill insects by paralyzing their digestion. To control mosquito larvae, granules (or slow-release rings) containing the israelensis strain are placed into buckets of plants or puddles of standing water. Bt persistence in water is longer than on sun-exposed leaf surfaces, but must be reapplied if favorable mosquito breeding conditions last for several weeks. Whenever we need to hold plants in buckets where the fish and naiads don’t have access, we use Bt granules to control the mosquitoes. In a healthy ecosystem, mosquitoes will also be eaten by purple martins, bats, and frogs.